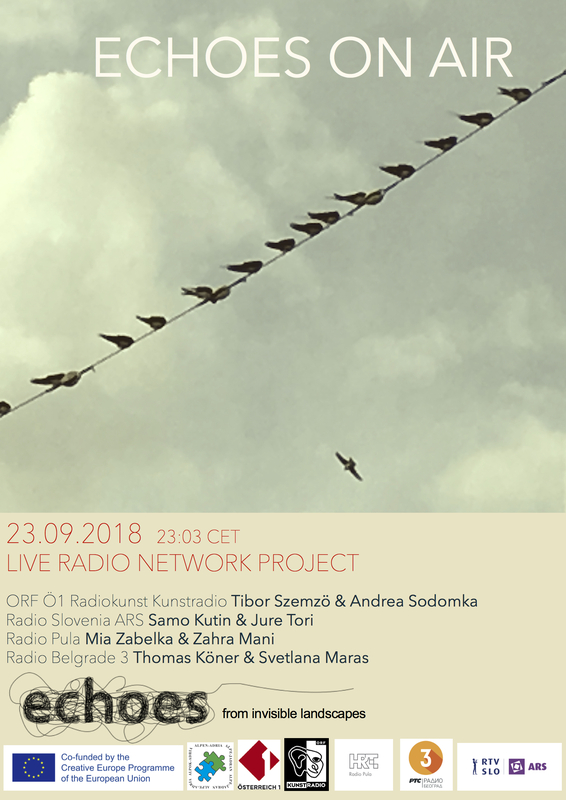 ECHOES ON AIR is a live simultaneous radio network project that will be broadcast in realtime on four major national radio stations (ORF, HRT, Radio Slovenija ARS and Radio Serbija / Radio Belgrade 3). Associate radio stations that will broadcast the stream and / or document the event include Radio Agora (AT), Usmaradio (IT). ECHOES ON AIR is part of the Alp-Adriatic initiative Echoes from Invisible Landscapes, a smaller scale cooperation project co-funded by the European Union. ECHOES ON AIR is an artistic and cultural bridge, built of sonic particles from across the region in all its linguistic, musical and historical diversity, bringing the region together in a large-scale radio event with broad audience outreach. ECHOES ON AIR is both a metaphor and a phenomenon. The Alp-Adriatic region is made audible in a collaborative live radio event, bringing together regional partners and their trans-disciplinary expertise. ECHOES ON AIR was developed by Mani doo (Istria). Project partners are project leader Enterprise Z (Styria), the University of Klagenfurt and Wieser Verlag (Carinthia) and Zveza Mink Tolmin (Slovenia). In each of the four studios, one artist will be performing and one artist will be mixing the live broadcast. The performances will be sent via live stream to each of the other participating studios. The live sounds will be mixed with the incoming signals from the other 3 studios. The mix of these four channels is broadcast to listeners. Four different versions of the same piece emerge, simultaneously, in the ether.